Flame Records. 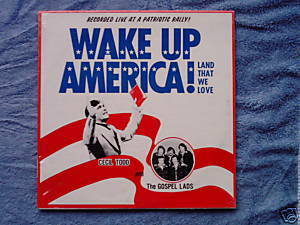 LP Wake Up America! Land That We Love. Cecil Todd and the Gospel Lads. "Recorded Live at a Patriotic Rally" in Orlando, Florida. Probably recorded for Revival Fires in Joplin, Missouri. Sealed LP. Cover with photos is VG.